One of the delightful signs of spring is the baby spider nursery. Every year we find one in a new place. Some years they are in places that conflict with human traffic. This year was one of those years. It looked as though the webbing with the egg sac started out on an angle between the front window and the porch. 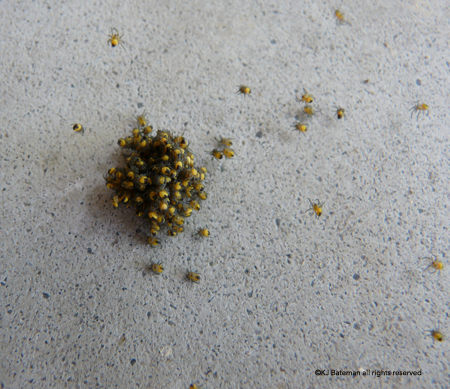 In the time it took to get the camera, the ball of spiderlings had settled onto the porch right in the path from driveway to front door. I ran string around the porch posts and made signs. Over the course of three to four days they ventured farther from the nest, at first returning each night to cuddle together in a ball. It takes three to four days for the babies to disperse completely. These will grow up to string their beautiful webs around the garden, catching raindrops in the late summer. i love that you made a protective area for them!!! Love the sign too!! ©2018 Kimberly J. Bateman all rights reserved. Simple theme. Powered by Blogger.